bl.uk > Online Gallery Home	> Online exhibitions	> Asia, Pacific and Africa Collections	> Mosque at Chanderi. 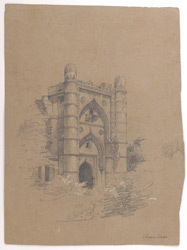 Drawing in pencil heightened with white by Frederick Charles Maisey of a mosque at Chanderi, between 1845 and 1852. Chanderi, situated strategically on the borders of Malwa and Bundelkhand, was an important an military outpost. The history of the place goes back to the 11th century when it was dominated by the trade routes of Central India. Chanderi has several historical monuments of the Bundela Rajputs and the Malwa Sultans. This drawings shows the central arched entrance to a ruined mosque flanked by engaged tapered bastions. The use of the 'ogee', an arch with a curved pointed apex, is typical of the sultanate-era architecture at Chanderi.